Hah, thanks chookstarter for the reminder. There is enough room in the bottom for a hatch basket, just need to find something suitable in 18 days. Ok the edge strips are on the last of the bare edges, vent holes are drilled. Bator is running and I will monitor overnight and add the third light tommorrow for redundancy. On track for adding the test eggs on sunday, note these are just cross breeds and not valuable eggs so to speak. I will candle at 7 days and go from there. OK OK, now I'm jelous. I want one. How Much? A+ for effort. The first test hatch of 8 eggs is at term and hatching. These were some of the first eggs collected after the winter laying strike and are all cross breed white leghorn and GL wyandotte bantam. 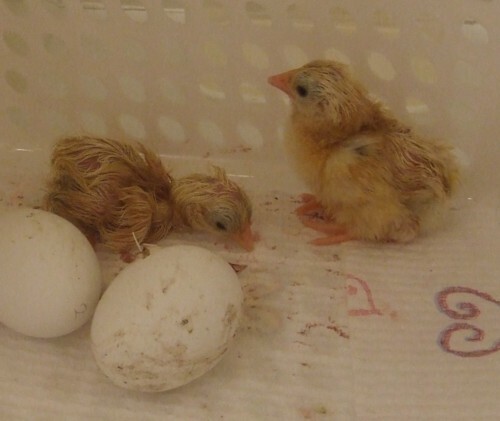 Out of 8, 3 were clears and two had blood rings and stopped developing after 3 days, so 3 are at hatch, one is out, one is halfway and one has pipped. The second batch are due on the 24th, from the original 18 set, 4 were obvious clears at 3 days the rest looked good with no bloodrings. 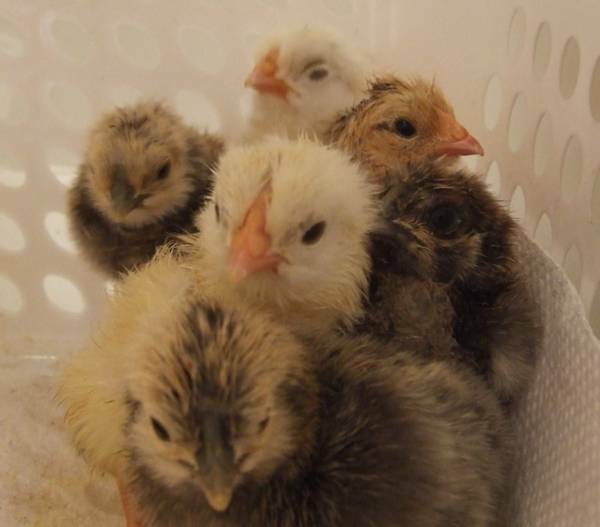 These are also a mix of cross breds (leggies, dotties and silkies plus a light sussex/GL wyandotte cross). This will be the last test batch and I am collecting pure breed eggs for the next lot. 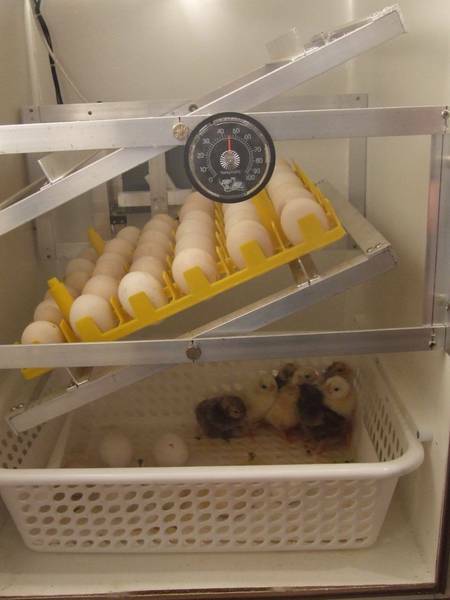 We have also been weighing the eggs and graphing the weight loss in excel to monitor humidity, DONT trust the cheap dial type hygrometers, they are at best a guide only. It has been reading lowish, but the weight loss trend on the graph shows that the humidity is to high. If any one wants to try mointoring the weight of a hatch to check their humidity measurements, pop me a pm and I will be happy to email the spread sheet to you. hello my name is Rhiannon this is my chick after she hatched. Her name is Feather! My youngest daughter Rhiannon typed the above message by herself, she is only six and is so proud to have a lovely new little chick. She is going to take the babies to school next week with Mum to show her mates in her reception/year one class. 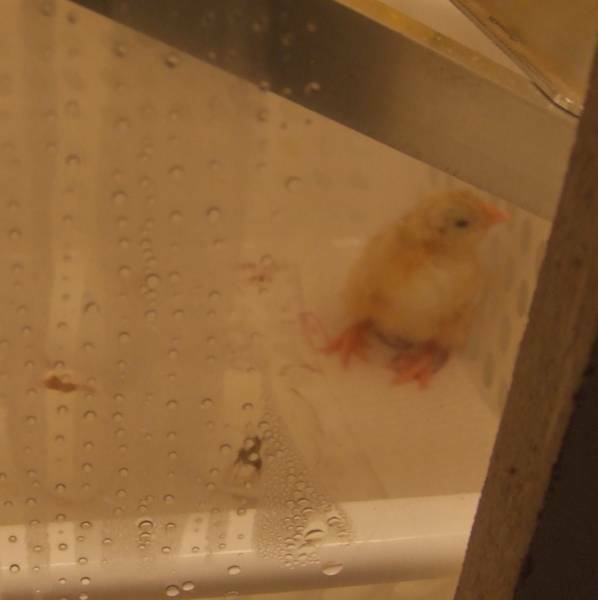 The second batch of eggs started to hatch on tuesday and the last chick I helped out tonight (dry membranes and stuck). Out of the 14 eggs, 13 are out, the 14th I have ditched as a dead in shell. My 16 year old eldest daughter fancies herself as a photographer and took the following pics. They are all crosses, 2 of the leghorn cross have feathered legs so you can guess what my silkie boys were up to. An interesting thing that I found was that if you very carefully put your hand over the bubs with your fingers down, they will huddle under your hand like mum hens wing. Yes I love it when I have one in the palm of my hand and cover over it with the other and it almost invariably just falls asleep - too cute! Microwaves operate at very high voltages,kilovolts. They also have in them huge capacitors which store large amount of energy at this very high voltage. You will need to discharge these capacitors. The capacitors can easily hold enough to kill you even years after being used. If you don't know what I'm talking about, don't go messing around with your microwave. I'm about to use the shell of a very old fridge as the base for an incubator........anything in a fridge that I need to be scared of? I thought you had to de-gas it or something? I read that somewhere - don't quote me though - raph is the person to ask because he's done a fridge conversion. I don't know a hell of a lot about fridges but as a general rule if something in the fridge moves you probably shouldn't eat it. I had the same concern, but couldnt find an answer. I beleive the old ones are full of Ozone, which isnt good for you, only the upper atmosphere. I removed my compressor and refrigerant system 'all in one'. If you are still concerned, call someone from a scrap yard, they might help you, as they deal with old fridges all the time and would be aware of any harmful gases. This is where I read that you need to 'de-gas' it - I think it only applies to older models where you have the coils in the back. I think the gas is freon - I believe it's the same stuff they use in car air conditioning systems. That all looks like sound advice to me.